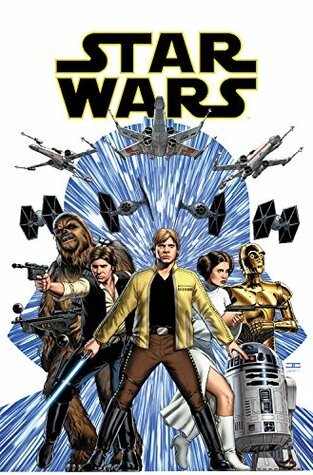 I recently reviewed the first volumes of both Marvel’s ongoing Star Wars books (Star Wars & Darth Vader). In conjunction with those two series, Marvel is also rotating through a slate of character-specific miniseries focused on the likes of Chewbacca, Lando, or in this case, Princess Leia. It is a time of celebration for the Rebellion. Striking from their hidden base, the brave pilots of the Rebel Alliance have successfully destroyed the Empire’s terror weapon, the Death Star. But that victory came at a terrible cost–both the pilots who gave their lives, and the very secrecy that the Rebellion depends on to keep their forces safe from Imperial attack. What’s more, the peaceful (though Rebel-friendly) planet of Alderaan was destroyed in a cruel display of the Empire’s military might and disregard for its subjects. Now, further angered by the destruction of the Death Star, the Empire has begun hunting down surviving Alderaanian refugees for reprisals. Princess Leia Organa has watched the Empire take her entire world. She’s not going to let them take her people too…. This one was….decent. The ideas were there, the characterization managed to walk the same tightrope between stately senator and reckless fighter that we saw in the films, and the art was excellently executed. The story itself though? A bit bland, a bit aimless, and a bit too riddled with plot holes. Leia sets out to gather her people and find them a safe home, and to a point she succeeds. She visits three planets with Alderaanian enclaves and evacuates them ahead of Imperial strikes, relocating them to a planet with a significant local militia that could supposedly keep them safe. But…really? You expect me to believe that this planet could successfully hold off the Imperial fleet if they put their mind to taking the planet? You could perhaps argue that such a high-profile operation would hurt their public image, but that doesn’t hold up. They just blew up Alderaan, reducing one of the major cultural centers of the galaxy to an asteroid field. We’ve not been told yet in this new canon how they spun that one in the news holos, but odds are they can do it again if they have to. Sure, the Death Star is gone, but even a single Star Destroyer could reduce all life on the planet to ash with an orbital bombardment once the planetary fleet is dealt with. A simple blockade to keep anybody from leaving, and then rain bloody hell on the entire system. I’m not advocating such a policy, obviously, but the Empire is certainly capable of such brutality. Then too, Leia visits three planets and then declares her mission a success. Are we to conclude that those are the only Alderaanians left in the galaxy? Surely not. Perhaps she simply intends to spread the word about the safe haven, allow any refugees to make their own way to safety. Which would be fine, except for the part where the Empire is actively hunting them….At the end of the day, this could have been better. Or at the very least, better explained. It really covers a lot of the same ground as Razor’s Edge back in the Legends canon, except that novel did it better. CONTENT: Mild to no profanity. Some violence. No sexual content. Dark days have come to Sherwood. King Richard has sailed for the Holy Land to do battle with the forces of darkness, taking with him the best of England’s strength. In his absence, darkness has taken root across the land aided by the would-be king John and his right-hand, the demonic Sheriff of Nottingham. Those loyal to Richard and the forces of light face an uphill battle as they try and protect the innocent from the heavy hand of the usurper. A man can be killed for standing against the king, but a legend? A legend can inspire hope even in the darkest of times. It is time for the Hood to once more protect the people of England…. 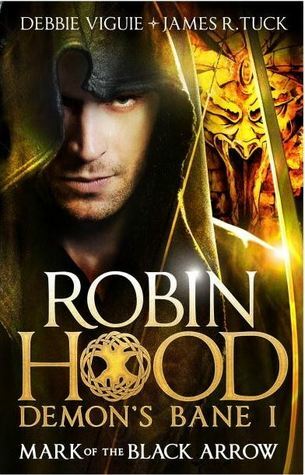 Just when you thought you’d seen every incarnation of the Robin Hood tales imaginable, Debbie Viguie and James Tuck pull this out of the hat. This time around John is no petty tyrant, concerned only with how much gold he can ring from the people and aided by cruelly efficient human agents. This time John is a servant to the forces of darkness, determined to break the spirit of the people and deliver all the world to darkness. Unless, of course, our heroes can stop him….Enter Robin Longstride, youngest son of Richard’s right hand. He’s more at home hunting in the forest than trying to fill his father’s shoes, but with the elder Longstride off to the Holy Land Robin hasn’t much choice. The only bright spot in being called to the castle is the chance to see the king’s niece, Maid Marian. The king’s ward since the death of her parents in a tragic fire, Marian was supposed to serve as an adviser to John in Richard’s absence. John…has a different idea. Robin’s cousin, Will Scarlet, is far more comfortable at court than in the woods, but his task is far more dangerous–to stay in the usurper prince’s confidence, saying nothing while horrors are perpetrated before his eyes. The book walks a bit of a tightrope between dismissing and wholly embracing the power of the Church, but I think that is appropriate for the time in which it is set. There were undoubtedly good monks and church leaders, like Friar Tuck and the Cardinal, but there were also brigands hiding in their ranks. Then too, it is politically incorrect (not to mention historically inaccurate) to cast the Crusades as a struggle between Good and Evil. Not that this book is all that concerned with historical accuracy–it is far more concerned with staying true to the traditional narrative, which is deeply flawed in historical terms. King Richard spent little time in England at any time during his reign, and certainly little resembled his benevolent character from most Robin Hood tales. John did die in Nottinghamshire, but it wasn’t his headquarters. He was just passing through when he took ill. I’m not saying this is necessarily a weakness to the book, or even that I’d take it a different direction if I wielded the pen, just that like most Robin Hood legend it smacks far more of fiction than it does history. It was an unusual tale, but very fun. I look forward to the publication of the rest of the trilogy with great anticipation. CONTENT: Strong, occasionally disturbing violence. Some crude language, mostly PG-13. Moderately-explicit sexual content. Strong occult content, from demons to necromancy. Everyone loves a good villain, and few capture the imagination like the hulking ebony figure of Darth Vader. It is then appropriate that Marvel’s main Star Wars line is accompanied by another ongoing series focused on our favorite fallen Jedi…. Spinning out of the main Star Wars book, Kieron Gillen paints us the picture of a Sith Lord on the ropes. In the wake of Vader’s failures at the Death Star and Cymoon I the Emperor has placed his erstwhile apprentice several rungs further down the chain of command than he is used to standing, forcing him to take orders from those he sees as inferior and not even bothering to hide the fact that he is keeping secrets. Vader’s going to have to outmaneuver all the rivals clamoring to fill the power vacuum left by his fall and find a way to work his way back into his master’s favor, or else face being replaced…. CONTENT: Some violence. Mild profanity. Little to no sexual content. Okay, cards on the table: I loved the Dark Horse Star Wars comics. Almost all of them, especially anything featuring the team-up of Ostrander and Duursema. So I was very much saddened to see that company lose the Star Wars license. Not surprised, following the purchase by Disney, as that mega-company also owns Marvel. I figured it was only a matter of time, and that turned out to be the case. So I was saddened, just as I was saddened by the relegation of a bunch of my favorite stories to the status of Legends. But the one thing I never expected was that Marvel would drop the ball. I mean, it’s bleedin’ Marvel! If there’s anything they understand, it’s comic books. Now, having read the first arc of their eponymous Star Wars series, I can confidently state that my faith was well-founded. We join our cadre of heroes as they attempt a daring assault on the Empire’s largest weapons factory, the entire planet of Cymoon I. Posing as a trade delegation from Jabba the Hutt arriving to negotiate renewed supply lines in the wake of the destruction of the Death Star, our heroes slip through security and set about rigging the automated factory’s reactor to blow sky-high. Everything is going to plan, until Darth Vader shows up to negotiate for the Empire…. I mentioned that this was amazing, right? The writing and art sync perfectly to sell you on the fact that you’re watching the continuing adventures of Luke, Leia, and Han. Luke is still a brash hotshot, still feeling his way with regards to the Force, and can be kind of whiny when he’s confronted with just how far he has to go. Han is just as sardonic and impulsive as ever, though the backstory they’re teasing for him may help ground him a bit. We’ll see how that one turns out. Leia is clearly in charge, driven to achieve justice for Alderaan and her family, and even Chewbacca knows to follow her orders. It’ll be interesting to see where they take her character in future arcs. One potential point of annoyance for some readers is going to be how closely this series and the Star Wars: Darth Vader series that runs concurrently are tied. Events from one series are offhandedly referenced in the other with no explanation, and have major repercussions at times. For example, Vader fails to apprehend our Rebel heroes in this book, is chastised by the Emperor and hires Boba Fett in the Darth Vader book, and then Fett shows up in this book to try and capture Luke. Complicating matters further is the fact that there’s a particular order you need to read these in to get the whole story, and even then you’ll get ahead of yourself unless you stop in the middle of an issue at times. I wasn’t that annoyed by it, but I’d checked out the timeline first and knew what I was doing. (In case you were wondering, the proper order is Star Wars #1-3, Darth Vader #1, Star Wars #4, Darth Vader #2-4, and then #5-6 of both series happen simultaneously, both culminating in the same scene from slightly different perspectives.) This is set in the first year following the destruction of the Death Star, maybe a couple months at most. CONTENT: Some violence. Minor profanity. Mild flirtation, and a few scantily-clad females in Jabba’s Palace. How’s about another short story from Star Wars Insider? Too bad, here it is anyway…. In this tale, Jason Fry serves us a short tale of Captain Rex and the 501st during the Clone Wars. So far as I know, the only place to get this is in Insider #139, so I wish you luck getting your hands on it…. Captain Rex is having a bad day. The Seperatists are running roughshod over his troops, and a mixed group of clones and local militia have just been captured by the clankers. Fortunately for him the locals are Lorrdians, masters of non-verbal communication who are able to speak volumes without opening their mouths. Now if only the droids had been stupid enough to send the clones a taunting holo of their prisoners…. This is a short story, and there’s admittedly not much to it. It is fun, though. This is one of those stories awkwardly stuck between Legends and Canon. Its not official, but it ties into the official television series so I’m being a rebel and treating it as if it were. I’d place it around the middle of the series, but the only hard data point we have is that it occurs sometime before The Clone Wars S04E07: Darkness On Umbara. CONTENT: Some violence. No profanity or sexual content. 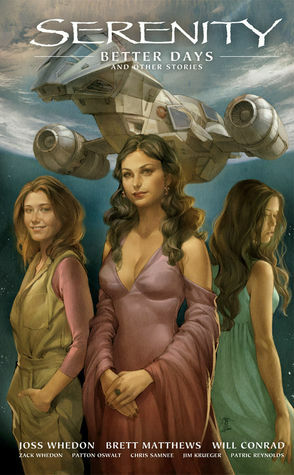 I mentioned my love of Firefly/Serenity last time, when I reviewed Those Left Behind, didn’t I? Anyway, if you’ve not checked it out yet you really should. 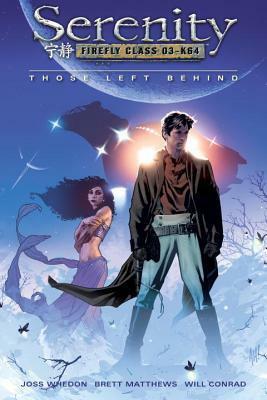 Better Days is the second collection of Serenity comics, featuring a three-issue miniseries and (if you get the second-edition hardcover) three other hard-to-find tales to boot. Most of this volume is set either during the television series or in the interim between the show and Those Left Behind, based on the characters present and their relationships. Better Days finds our favorite crew of ne’er-do-wells knee-deep in a heist, just like a thousand times before. Except this time…this time they strike it rich. Our crew can handle misfortune just fine, they do that all the time. But success? Success just might be the death of them…. As with the previous miniseries, this one felt like it was ripped from the screen, almost like it was supposed to be an episode of the show. The writing was spot on, and the art was awesome. The Other Half is a short little tale featuring our heroes attempting to transport a fugitive to meet his friends…while Reavers try and eat their faces. Again, the dialogue was stellar, and the central focus on River was a nice change. Downtime is another short episode, this time following our cast as they attempt to wait out a snowstorm keeping them from taking off. Difficult as it is to pull off in a story this short, every character gets at least a moment to shine. The art isn’t quite as pretty this time out, being a bit more impressionistic, but I enjoyed the tale nevertheless. Finally, and most heart-breakingly, Float Out is a one-shot tale set after the film and featuring the friends of a certain fallen character toasting their memories of him. I’ll refrain from further discussion in the interest of avoiding spoilers for those who’ve yet to see it, but that final page might just make you tear up all over again at the demise of [REDACTED]…. CONTENT: Mild profanity, unless you can read Mandarin Chinese. Then I imagine it would be R-rated. Strong violence. Occasional sexual content consistent with the show. Yay Firefly comics! Okay, so they’re marketed under the title Serenity, after the theatrical follow-up to the television series, but they’ll always be Firefly to me. What’s that? You’ve never watched this most excellent, most canceled of sci-fi television series? What are you still doing here then? The series is available on perpetual rotation for free via Hulu, on Netflix, or on DVD from Wal*Mart for like ten bucks. You really have no excuse not to watch it. You won’t be sorry you did…. Okay, in case you’ve been living under a rock for the past decade, Firefly was a sci-fi television series developed by the inimitable Joss Whedon and Tim Minear for Fox Television in 2002. Following a series of debacles at the studio, including the decision to air the episodes all out of order, the series was canceled after only fourteen episodes. The show’s devoted fan base was devastated, and promptly started a massive grassroots campaign to save the series. Based on the sheer enthusiasm of this fan base, Universal Pictures took the then-unheard of step of contracting a theatrical follow-up to the television series. Ever since there have been persistent rumors that the series is coming back, but for now and maybe forever the Browncoat army (as we Firefly/Serenity fans are known around the interwebs) have to content ourselves with the stellar comics Dark Horse intermittently releases. After the Earth was used up, Humanity found itself a new home in a massive star system with hundreds of planets and moons, terraforming each until it could sustain human life. The central planets formed the Alliance and successfully subjugated the entire system, crushing the Independents in a bloody civil war. Most of the surviving Independents have drifted out to the fringes of society, out where Alliance control is nominal at best, out where a ship under your feet and a gun on your hip will give you a chance to carve out a living for yourself and those that count on you…. Those Left Behind serves as the bridge between Firefly and Serenity, helping to wrap up a few of the discarded plot threads that didn’t make the cut for the film. Here we see Mal struggling with Inara’s decision to leave, as well as the catalyst for Shepherd Book’s own departure. On a more plot-related note, witness the reappearance of Agent Dobson and the identity of those sinister Alliance agents in the blue bodysuits…. The best compliment I can offer this book is that it legitimately blends into the rest of the franchise. The dialogue, timing, and characterization is all spot-on, easing the transition between the different media. The art is incredible too, so that helps. I could say more, but really it all boils down to this: Watch the show, read this comic, then watch the film. You won’t be sorry you did. CONTENT: Minor profanity, including a good deal of cursing in Chinese. A fair amount of violence, gory and occasionally disturbing. Mild sexual innuendo, mostly as under-the-breath commentary and asides.